Many people insist, hoping that they are correct, that an infinitely meciful and loving God could not possibly consign anyone to eternal punishment. There are, however, two faults to this reasoning: First, God is just, as well as merciful and; second, God does not condemn anyone to Hell. Sinners condemn themselves. The presence of sin, which in in plentiful supply in our contemporary society, demands the existence of hell. We know that God's laws are broken daily, often in very serious ways. Therefore, his justice cannot ignore these violations nor allow the perpetrator to reveal in impunity. Because of his holiness, God must avenge infractions of his moral order in a manner which maintains an equality between the gravity of the act and the severity of the punishment. We know that in this life sin is not always punished nor is virture rewarded. Yet the scales of divine justice must be balanced, if not in this world then in the next. If there was no retribution beyond that which we observe, then God would be indifferent to the existence of good and evil. He would be wanting in justice and holiness, which, of course, cannot be. Therefore, evil must be punished in accordance with is seriousness. 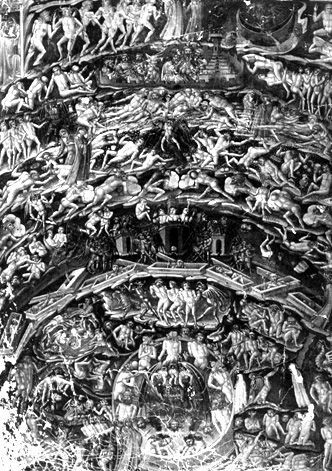 The existence of hell is revealed in Sacred Scripture, explained in sacred Tradition and taught by the sacred Magisterium. Rather than entering into a lengthy and detailed discussion of the proofs of this doctrine, a far more practical approach is to accept the teachings of the official magisterium, especially because it is safeguarded against error by the presence of the Holy Spirit who is the spirit of truth. The Church teaches, "de fide" (which means that this doctrin must be believed), that the souls of those who die in the condition of personal, unrepented, grievous sin enter hell. Now, eternal suffering is of two kinds: first, the pain of loss. This the very core of hell's torment because it is the loss of the beatific vision, of beholding God face to face, of the soul seeing God by direct intuition, clearly and distinctly. Thus the very purpose for which the soul was created has been rejected. Life has been wasted in failure. There is the despairing realization that opportunities were offered but refused. The souls in hell know that they will never see God nor be united to Him in love. There is the gnawing regret of having , by their own deliberate folly, forfeited eternal blessings for transistory pleasures. They had abandoned God by turning away from Him in mortal sin so now God has turned away from them. But the longing for God remains - unfulfilled and turned into hate, an the tortures of hell endure through all eternity. The vision which the children saw at Fatima is a most descriptive lesson on this subject. In addition to the pain of loss there is the pain of sense: fire, weeping, wailing, gnashing of teeth in fury, total abandonment in a world of frenzied demons. The fire of hell is different from the fire which we observe on earth. In hell the fire burns but never consumes. Hellfire is not a figure of speech but a reality created by a just Judge to punish the fallen spirits. At the final judgement the bodies of the damned will join their souls so that both will share these pains of sense. This is only logical since the body was the instrument of serious sin. As the body pleasured, so not it must suffer - a suffering beyond our imagining - a suffering which will never end. The important truth for our personal salvation is that we know that hells exists, that it is a place of everlasting torment where lost souls are condemned for eternity, as we learn from the inspired word of God: "Depart from me, you accursed, into the eternal fire prepared for the devil and his angels" (Mt. 25:41). Our concern need not be about any scholarly discussion concerning the existence and nature of hell but about how we can escape it by avoiding all which leads to serious sin and the death of the soul.